Every time I go out, people ask, “What’s new?” And, in keeping with social custom, I give them a non-answer: “Not much.” Sometimes I even say, “Same old same.” Can you believe how stupid that sounds? Neither can I. Worse, it’s a total lie. Things are new. Samba’s midway through devouring a new rope toy. I cooked a new orzo salad last weekend. I’m newly obsessed with dapper Australian singer Willy Moon (just try not dancing to “Railroad Track”). And I’m contemplating a new adventure that involves driving a three-wheeled motorbike across Peru. Okay fine, I’ve been thinking about that one for a while. First, I made a plea for a Downtown Las Vegas water fight. You know, a depths-of-summer, all-out, Super Soaker-packing, blast-your-neighbor affair inspired by the water gun battles in Jerusalem that help relieve the heat and tension just before Shabbat. Then I found my new favorite bar crawl, a Downtown jaunt that doesn’t touch Fremont Street, doesn’t have a single dress code or velvet rope and includes a place that serves seasonal punch in charming little glasses. 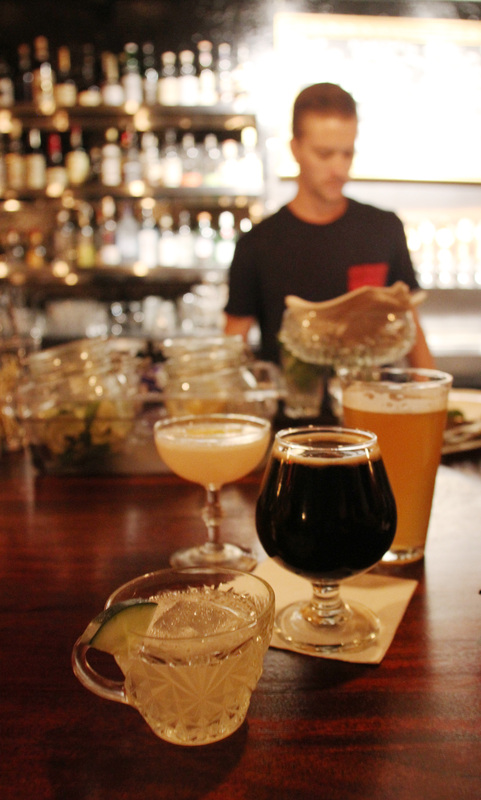 It can be your favorite new bar crawl, too. Finally, I got to spend an afternoon at Calico Basin gawking at local rock climber/Porsche racer/pilot/all around badass Simon Peck make tricky routes look like absolute cake. He’s as humble as they come, and watching him on the cliffs made me want to squeeze my feet into a pair of elfin-sized shoes and give climbing another shot.